Pope Francis visits the town of Assisi where St Francis lived and died. In March, Archbishop Jorge Mario Bergoglio was made Pope, taking on the name of Francis, and immediately the new Pope brought a taste of the loved saint to the Vatican. As he prepares to make his first visit as Pope to the town of Assisi, Heart and Soul travels to where St Francis lived and died, to hear about the enduring appeal of this saint. John Laurenson hears how the wealthy Francis, the son of an affluent trader, gave up his wealth, stood naked before God and pledged his life to him - and committed to rebuilding his church. 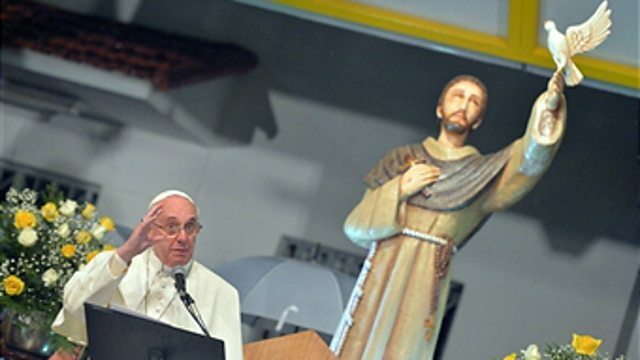 St Francis travelled, spreading the word of God in a bid to re-evangelise Christians. 'Re-evangelise' is a term that has been used to describe the focus of Pope Francis for today's Church. In the months since he first stood on the balcony overlooking St Peter's Square, greeting the crowd with a simple ‘Good Evening’, his Papacy has been a lighter, humbler, almost unscripted one and much has been made of him forgoing the trappings of his role as leader of the world's 1.2 billion Catholics. John will meet the devotees of St Francis and asks them what it means for the new Pope to take their Saint's name and whether in doing so he has also adopted some of the characteristics of the much loved saint.